French fashion house Lanvin was founded in 1909. Its founder is Jeanne Lanvin and her fashion career started by making clothes for her children. People noticed the beautiful details and styles and started asking if she could make some designs for them. Lanvin brand was born and wonderful embroideries and intricate details made the Lanvin brand among the elite French fashion houses. Today the brand's clothing, perfumes and accessories are sold worldwide from Las Vegas to Seoul, from London to Geneva. The biggest seller of this brand's products in the United States is Barneys store. 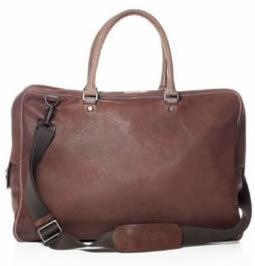 Lanvin man bags collection has a variety of man bags, for example the Lanvin weekend bag in brown leather is a nice addition. The men's messenger bag in printed python is an attractive and practical bag that will certainly draw attention because of the unusual print. Men's bags are known for the classic leathers and no excessive prints or decorations policy, however this masculine messenger bag takes a different approach and could become one their selling successes. The bowling bag from their web sales section has fulfilled the basic requirements section. It is black and spacious and has a very well organized interior. 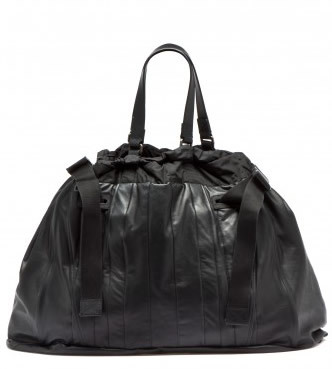 It is also made of leather (calfskin) that adds to the durability for this carryall. It can be practically used for everything from travel to gym bag. The bag costs 1,555.00 USD. Sold online. It can easily carry a laptop if provided with a proper sleeve. This brand also offers great selection of men's backpacks. These laptop backpacks can be bought via internet. Learn more on Lanvin sale to get some discounted bags for men.